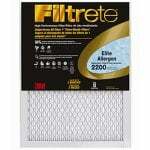 Note: When you order a selected size 3M Ultimate Allergen Filtrete filter, it will automatically be upgraded to the Filtrete Ultimate Allergen series at no additional charge. Please see below for the filter sizes available for upgrade. The Filtrete Ultra Allergen Air Filter boasts a Filtrete 1500 MPR rating and is one of the optimal-performing furnace filters on the market. Not only will the Ultra Allergen Filter use its electrostatically charged fibers to attract and retain micro-particles and airborne allergens but it will also capture bacteria and particles that can carry viruses. 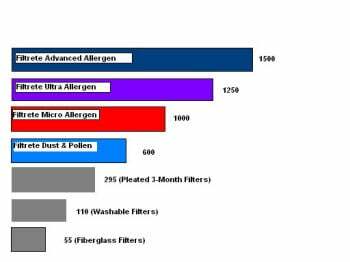 The Filtrete Ultra Allergen Filter provides an even better airflow than the Micro Allergen Filter, with 15% lower resistance. Cigarette, cigar, fireplace, and wood burning stove smoke contain very tiny particles composed of wood tar, gases, soot, and ashes that can cause severe irritation and allergic reaction in some people and even trigger bronchitis or asthma attacks in others. Smoke also contains carcinogens which could also lead to lung disease and cancer. Even if you live in the remote countryside in a small town with little to no industry chances are the air in your home contains smog. Smog, a combination of smoke and fog, makes its way from urban/industrial areas of the world right to your doorstep on the wind. Breathing in smog for prolonged periods of time can not only cause allergic symptoms such as watery eyes, and running nose, but also more serious respiratory issues such as wheezing, coughing, asthma attack, and sore throat. This air filter lasts 3 months and meets the American Lung Association Health House Indoor Air Quality Guidelines. * - Denotes selected sizes available for upgrade. Microparticle Performance Rating represents the effectiveness of a filter at capturing the smallest airborne particles measured in the industry standard test. 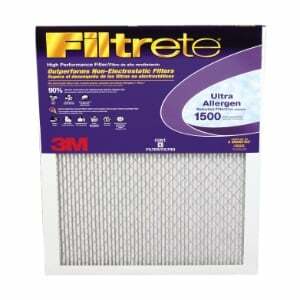 This Filtrete filter received an MPR 1500 and MERV 11 rating.